Arsenal will reportedly come under increasing pressure to keep Aaron Ramsey with Juventus being tipped to table a pre-contract offer in January. The 27-year-old’s current contract with the Gunners will expire next summer, and coupled with Sky Sports reporting last month that talks over a renewal have broken down, it’s expected that Ramsey will move on. 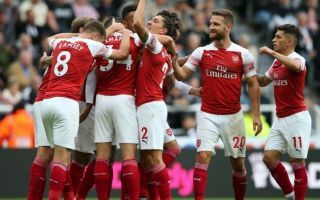 That will undoubtedly be seen as a blow for Arsenal given his ongoing importance to the club, albeit it looks as though Unai Emery may well have to cope with his loss after this season. According to the Daily Mail, Juventus will look to agree on terms in January to sign the Welshman on a free in the summer, and so he could perhaps be set for an intriguing new challenge in Italy instead of extending his stay in north London or perhaps even in England. The Bianconeri have been dominant in Italy for years, winning seven consecutive Serie A titles along with countless Coppa Italia trophies while also making an impression in Europe. Signing Cristiano Ronaldo this past summer will surely take them closer to ending their agonising wait for Champions League glory which now stretches beyond two decades, and so from a footballing perspective, it’s easy to see why such a move would appeal to Ramsey. Given he could join on a free transfer, it remains to be seen if that’s enough to convince Juve to offer him a lucrative contract, with the Mail noting that the Arsenal ace is believed to want £250,000-a-year. That’s a lot of money, but given his potential ability to suit the Italian game perfectly in terms of dictating the tempo of games and using his technical quality and creative class as well as his goal threat to great effect for Juve moving forward, it could be enough to persuade them to do what is needed to wrap up a deal.